A new partnership has been announced between CHIME’s Association for Executives in Healthcare Information Security (AEHIS) and the Foundation for Innovation, Translation and Safety Science’s Medical Device Innovation, Safety and Security Consortium (MDISS). The aim of the new collaboration is to help advance medical device cybersecurity and improve patient safety. The two organizations will work together to help members identify, mitigate, and prevent cybersecurity threats by issuing cybersecurity best practices, educating about the threats to device security, training members, and promoting information sharing. For the past three years, AEHIS has been helping healthcare organizations improve their information security defences. More than 700 CISOs and other healthcare IT security leaders have benefited from the education and networking opportunities provided by AEHIS. AEHIS helps its members protect patients from cyber threats, including cyberattacks on their medical devices, though its educational efforts, sharing best practices, and many other activities. MDISS now consists of more than 2,000 hospitals and dozens of medical device manufacturers who are working together to improve medical device cybersecurity. MDISS has helped to make medical device risk assessments cheaper, faster, and more accessible, while bringing together regulatory bodies, patient advocates, insurers, security researchers, medical device manufacturers, and healthcare providers to advance best practices in medical device cybersecurity and risk management. It is hoped that the collective voice of AEHIS and MDISS will help to improve information security practices and ensure patients – and health data – are better protected. 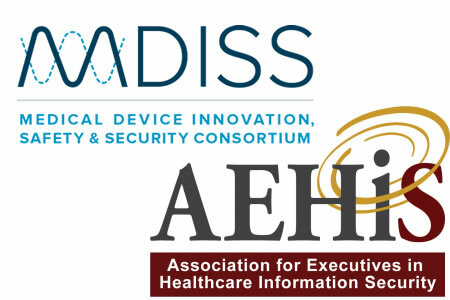 “Together, AEHIS and MDISS joining forces to advocate and advance better medical device security will benefit AEHIS members and MDISS stakeholders alike,” said Sean Murphy, chair of the AEHIS collaborative relationships committee and vice president and CISO at Premera Blue Cross. Examining the issues that are preventing the sharing of cybersecurity and medical device vulnerability information and helping to support information sharing through existing or modified information sharing efforts.